German Academic Exchange Service (DAAD) statistics has revealed that Germany has come out as a desired destination for growing number of Indian students willing to pursue higher education overseas. This is illustrated by the rise of 114% with regards to enrollment of Indian students in higher education courses since 2008. Germany saw a rise from 3,516 in the 2008-09 academic years to 7,532 in 2012-13 as regards to student’s enrollment. Australia, USA, UK and Canada are the most sought after destinations for Indian students as there is no barrier for language. Germany, which holds the fifth place with respect to Indian student’s enrollment on campuses, has sought to compensate language barrier by introducing English courses and moderating visa rules to authorize the students to find jobs after completing their studies. Engineering courses were the major choice of study, which accounted for 48%, while mathematics and natural science have followed, constituting 19.8%. Besides, Information technology represented 13.8 %, and economic, social sciences and law courses which made up 9.4% were regarded to be the other courses in demand for Indian students in Germany. 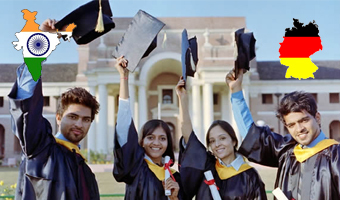 Indians constitute the second largest foreign student population in Germany, next to China. Want to know more about German immigration fill out MoreVisas Enquiry form or follow us on Facebook, Twitter, Google+.